The sylvari from Guild Wars 2. What a wild week it has already been! Right now I'm in the middle of working on a freelance assignment for Crystal Frasier's Rogue Genius Games, as well as preparing for a pair of interviews that will appear here on the Encounter Table—though more on those at a later date. Right now, some of you may be aware that I've been selected to the Top 32 of Paizo Publishing's RPG Superstar competition. I'm competing alongside some of the brightest undiscovered talent for the reward of writing a full 64-page adventure module (or the runner up prize of a Pathfinder Society Scenario). So, for the next few weeks, updates from the Encounter Table may be a bit thinner than usual as I focus my efforts on these projects. That said, I've got something special for you all! Today's Pop Creature article comes from one of the few massively-multiplayer RPGs I've really grown to love: Guild Wars 2. While I don't really have the time to run around busting heads with my engineer anymore, I do hold a singular adoration for their wonderful races and finely crafted lore. So today's article goes out to the enigmatic sylvari race, presented—not as a bestiary entry—but as a playable race using the rules for race creation found in the Advanced Race Guide. You may also notice a shout-out to a certain mythic creature introduced in the recent Bestiary released. The sylvari are a race of plant-like creatures forged from spirits of the First World. They are a relatively young race, historically speaking, and have emerged onto the material plane for reasons unknown to their kind, knowing only a sense of wanderlust and a desire to travel the world and seek out new experiences, but always feeling a nagging calling at the back of their subconscious that reminds them of a greater purpose lying somewhere out beyond the next horizon. It is this unknown purpose that drives the sylvari to explore and learn, and with each sylvari that travels the world the collective of their people grows in the breadth of their experiences. Most sylvari value freedom, both of body and expression, balking at the constraints of society that would tie them to one place for too long. Some of their people, however, lack this wanderlust nature and become wardens of their people, watching over the secluded groves that birth their race and acting as mentors, protectors, and guides for their kin. Physical Description: The sylvari are humanoid creatures forged from the essence of the First World, drawn into the material plane, and cocooned in a plant-like form. 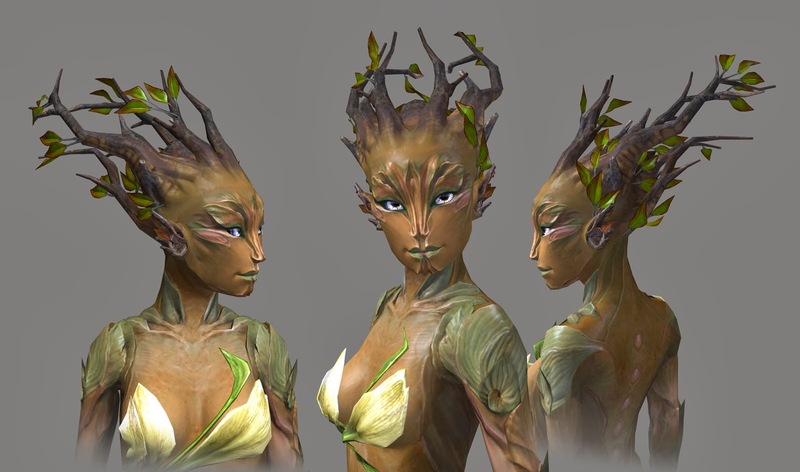 While sylvari display plantlike features such as hard wood for bone structure, foliage and petals for hair, and bark acting as flesh, the sylvari are not plant creatures. Rather they are a hybrid of plant and mammal living in synergistic harmony. Golden sap moves through their veins instead of blood and pollen falls off of them as they move. Though while sylvari can seemingly absorb sunlight and become rejuvenated, they still must eat and drink to survive and are omnivores—consuming both plant and animal matter. They are much more slender than the average human and on average are a foot shorter. Society: Sylvari are not born—not like most humanoid races, at any rate—and emerge fully formed from golden fruit pods which grow on the branches of ancient irminsulB4; mythic trees that serve as gateways between the planes. Their "gender" is selected by the irminsul they grow on prior to emergence and is distinguished by the same general features as human genders. Sylvari heal by means of bark-like growths over injured areas, rather than the generation of traditional scar tissue. One of the sylvari's most visible physical traits are luminescent cells in their skin, causing their veins and portions of their body to glow in the dark with the rhythm of their heart. Prior to emergence they share a communal bond through their irminsul which is a dream-like state of disembodied consciousness representing their time as spirits within the first world. In this state a growing sylvari is exposed to the consciousness of their irminsul and the collective knowledge and memories of what every other sylvari has thought and learned of the world. When they emerge a portion of this knowledge remains with them, and a small fraction of what other sylvari have seen and experienced, though this rarely includes specific memories. Sylvari, therefore, do not have a childhood period of development and begin their lives already having the foundation of knowledge necessary to begin a life as an adventurer. After emergence from their fruit, the bond between irminsul and sylvari is weakened, but still serves as a paternal bond between parent and child and from most sylvari to other plants as well. Rarely, two sylvari can grow within the same pod, sharing an uncanny bond between one-another. Sylvari typically spend a few months, following emergence, acclimating themselves to a physical world within the confines of the well-guarded and secretive enclaves that protect their irminsul. Most feel an urge to move within that time, departing for distant horizons with supplies provided for them by sylvari born without the wanderlust that have a more grounded sense of life. Residents of a sylvari enclave are typically residents for life who serve as mentors and protectors of the irmimsul, while others are former wanderers who have returned to settle down as the wanderlust inexplicably fades and the irminsul calls them back for reasons unknown. Sylvari souls do not exist within the same life-cycle as most other creatures. They do not progress to by judged in the boneyard upon death, but instead are recycled back into the first world like natives to that plane. Instead of simply being reincarnated on the first world, however, a sylvari's soul is returned to the collective consciousness tied to the irminsul, whereby their experiences are added to the collective whole of their people once more. Relations: Sylvari have an innate curiosity towards other races, but often find themselves at a disadvantage socially due to their otherworldly and awkward natures. They share much in common with elves due to their association with nature, and their tie to the first world makes gnomes a race of people that they feel a distant kinship to. The ghoranISB—a race of plant creatures created in Nex—both fascinate and horrify the sylvari due to their plant-like nature and their dark origins, respectively. Due to their relative newness to the material plane, however, most sylvari enclaves have not formed strong ties with any one species or culture. Alignment and Religion: Sylvari are free-spirited and prone to wanderlust, and as such are more chaotic than lawful. However, sylvari who become protectors of the irminsul enclaves tend towards lawful alignments, and this division of personality appears to be an artificial construct of the respective irminsul that spawns the sylvari. Some rumors within sylvari enclaves speak of irminsul that have been corrupted by evil fey or demons, spawning destructive and violent sylvari with hateful intentions. Sylvari are not very religious, but those that find a particular calling are drawn to gods of nature, freedom or beauty. Adventurers: As sylvari are born fully matured and with inherent understanding of skills and abilities tailored by their irminsil, they are especially suited to becoming adventurers. Most sylvari leave their communities to pursue this lifestyle, using the inborn talents gifted to them by the irminsil to satisfy their desire for exploration and understanding before either returning back to their enclave as the wanderlust fades, or they meet a violent death. Ability Score Racial Traits: Sylvari are hardy and wise beyond their years, but they have difficulty relating to others. They gain +2 Constitution, +2 Wisdom and -2 Charisma. Type: Sylvari are outsiders with the native and sylvari subtypes. Size: Sylvari are Medium creatures and thus have no bonuses or penalties due to their size. Base Speed: Sylvari have a base speed of 30 feet. Languages: Sylvari begin play speaking Common and Sylvan. Sylvari with high Intelligence scores can choose from the following languages: Aklo, Elven, Terran, and Treant. See the Linguistics skill page for more information about these languages. Bond to the Land (Ex): Sylvari gain a +2 dodge bonus to AC when in their born to nature favored terrain. Born to Nature (Ex): Sylvari gain a number of special abilities depending on the terrain it was attuned to at birth. Choose a ranger favored terrain type. This chosen terrain affects the bond to the land, camouflage and terrain stride racial traits. In addition, Survival and Knowledge (nature) are always class skills for sylvari. Camouflage (Ex): Sylvari gain a +4 racial bonus on Stealth checks while within their born to nature favored terrain. Terrain Stride (Ex): Sylvari can move through natural difficult terrain at their normal speed while within their born to nature favored terrain. Magically altered terrain affects them normally. Toxic (Ex): Sylvari possess the capacity to generate of plant-based toxins in their blood. A number of times per day equal to its Constitution modifier (minimum 1/day), a sylvari can envenom a weapon that it wields with its toxic blood (doing so inflicts 1 point of damage on the sylvari). Applying venom in this way is a swift action. Sylvari are immune to other sylvari's venom. Sylvari Venom: Injury; save Fort DC 10 + the 1/2 user's Hit Dice + the sylvari's Constitution modifier; frequency 1/round for 6 rounds; effect 1d2 Dex; cure 1 save. Low-Light Vision: Sylvari can see twice as far as humans in conditions of dim light. Plant Hybrid (2 RP): For the purposes of effects targeting creatures by type (such as a ranger's favored enemy and bane weapons), sylvari count as both humanoids and plants. Sylvari gain a +4 racial bonus on all saving throws against mind-affecting effects, paralysis, poison, and stun effects, and are immune to sleep effects. Treespeech (Su): Sylvari have the ability to converse with plants as if subject to a continual speak with plants spell. Tendril (Ex): As a free action a sylvari can grow a long, flexible tendril of plant matter from their body that can be used to carry objects. They cannot wield weapons with their tendrils, but they can use them to retrieve small, stowed objects carried on their persons as a swift action. Light Dependent: Sylvari take 1d4 points of Constitution damage each day they go without exposure to sunlight. Improved Natural Armor: Some sylvari are covered with bark-like growth that renders them more resistant to harm. A sylvari with this racial trait gains a +1 bonus to natural armor. This racial trait replaces tendrils. Enclave Protector: Sylvari with a less inherent sense of wanderlust tend to become protectors of their people and their settlements. Sylvari with this racial trait add +1 to the caster level of any abjuration spells they cast. Sylvari also gain the following spell-like abilities (the caster level is equal to the user's character level): Constant—nondetection; 1/day—faerie fire, obscure object, sanctuary. This racial trait replaces treespeech. Lightbringer: Often times, sylvari are born without the ability to speak to plants, but instead possess a higher rate of luminescent light-reactive cells in their body and are immune to light-based blindness and dazzle effects, and are treated as one level higher when determining the effects of any light-based spells or effects they cast (including spell-like and supernatural abilities). A sylvari with an Intelligence of 10 or higher gains the following spell-like ability: At Will—light. This racial trait replaces treespeech. Thorny Body: Some sylvari are covered with conveniently placed thorns that ward off enemies. These thorns deal an extra 1d3 points of piercing damage on a successful grapple attack. The spikes count as a natural weapon. You can also make a regular natural attack (or secondary natural attack) with the spikes. An enhancement bonus to natural armor does not improve the spikes' effectiveness, but the spikes can be made into magic weapons in their own right with magic fang. This racial trait replaces toxic. Gliding Wings: Some sylvari can grow fibrous wing-like appendages from their backs as a free action. These growths resemble enormous leaves in the shape of moth wings. A sylvari with this ability takes no damage from falling (as if subject to a constant non-magical feather fall spell). While in midair, sylvari can move up to 5 feet in any horizontal direction for every 1 foot they fall, at a speed of 60 feet per round. A sylvari with gliding wings cannot gain height with these wings alone; it merely coasts in other directions as it falls. If subjected to a strong wind or any other effect that causes a creature with gliding wings to rise, it can take advantage of the updraft to increase the distance it can glide. This racial trait replaces prehensile tail and terrain stride. Shillelagh: Some sylvari can draw out magical power from ordinary wood and can use shillelagh as a spell-like ability once per day. The caster level of the spell is equal to the user's character level. This racial trait replaces camouflage.